See what events are happening at The National Hotel in Miami Beach. Whether you are a guest, local or a traveler, come join the activities hosted in the heart of South Beach at The National Hotel, such as yoga in Miami Beach, pilates classes in South Beach, live music in Miami, or special events. You can RSVP or purchase tickets right here on our website. Come celebrate Easter at the National Hotel with our Easter Sunday Brunch complete with LIVE music, Easter Egg Hunt and Visit from the Easter Bunny. 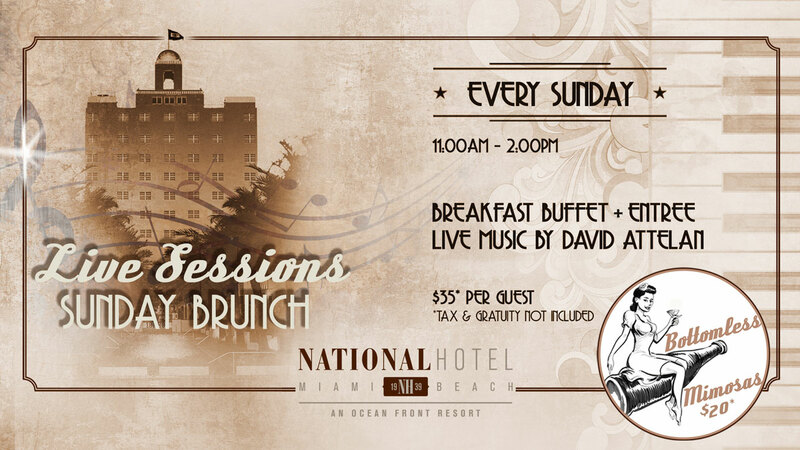 From 11:00 AM to 3:00 PM., hotel guests, locals, music lovers and visitors alike will savor brunch favorites from Tamara’s Bistro, National Hotel’s restaurant featuring contemporary cuisine with a Miami twist. Patrons can indulge in a brunch buffet that includes: a full breakfast station (eggs and omelets, chicken apple sausage, home-style potatoes, waffles and fresh fruits); specialty breakfast items; bread station; desserts; live carving station, pasta, fresh fish, free range chicken. Mediterranean display, salad display, domestic and imported cheeses, charcuterie, ceviche. Join us this Friday night from 8:30PM till late for an evening of live music at the National Hotel's Blues Bar. Join us this Friday night from 8:30PM till late for an evening of live music at the National Hotel’s Blues Bar. Enjoy Cocktails, Tapas, and Live Music & Performances by Rick Leonard & Mailyn Soulfree. When in Miami Beach, relax your body and clear your mind by joining us in our evening yoga classes Saturdays and Sundays. This Hatha based class is a sequence of breathing exercises and traditional yoga poses, followed by a deep guided relaxation that will leave you full of energy and in a peaceful state of mind. Instructor Jenny Cornero leads you gently into the conscious connection of movement, awareness and balance. Join us this Saturday night from 8:30PM till late for an evening of live music at the National Hotel’s Blues Bar. Enjoy Sunday Brunch while listening to live Sessions with David Attelan. Tamara’s Bistro invites guests and visitors to experience our Traditional Brunch Buffet, Bottomless Mimosas and a la Carte Menu pairings, while listening to the soothe sounds of talented pianist David Attelan. Last seating is at 2pm. Join us by The Aqua Lounge at The National Hotel for incredible live music by the talented Fox Brothers. Come and hear the impressive Spanish guitar and Flamenco sounds and skills of this dynamic duo, while sipping on delicious cocktails and scrumptious tapas. Join us this Sunday night from 8:30PM till late for an evening of live music at the National Hotel's Blues Bar. Join us every Monday night starting January 7th at 6:30PM for an evening of live music at the National Hotel's Blues Bar. Join us every Monday night starting January 7th at 6:30PM for an evening of live music at the National Hotel’s Blues Bar. When in Miami Beach, relax your body and clear your mind by joining us in our evening yoga classes Tuesday and Thursdays.